Herded aboard slave ships in West Africa, a group of Garífuna forebears were likely destined for New World mines and plantations when they wrecked off the Caribbean island of St. Vincent in 1635. They found refuge with the island’s Carib and Arawak Indians, immigrants from South America. The two peoples blended through marriage, creating the Garífuna culture—Caribbean fishing and farming traditions with a mixture of Native South American and African music, dance, spiritual beliefs and language. The Garínagu (Garifuna people) prospered and coexisted peacefully with French settlers who came later in the 17th century. Then English colonists began to arrive and demand land. The tensions eventually turned to war. Hopelessly outnumbered by British troops, the Garíngu and their French supporters surrendered in 1796. The British exiled the Garínagu to the island of Baliceaux. They were imprisoned there in appalling conditions, and more than half died. The following year survivors were shipped to Roatán Island off the coast of Honduras. According to legend, the Garinagu hid cassava, a mainstay of their diet, inside their clothes, where it stayed alive watered by the sweat of the tightly packed captives. They planted the cassava on Roatán, where it grew abundantly. Soon the Garínagu established fishing villages along the coasts of Honduras, Nicaragua, Guatemala, and Belize. 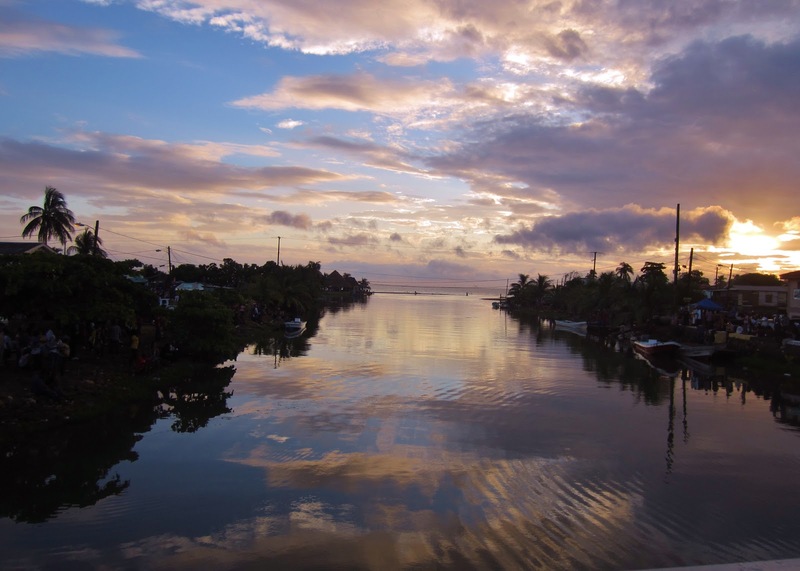 Each year in Belize, when locals reenact the arrival of the Garifuna people in 1832 to Dangriga, they slip out to sea in boats, then ride the surf onto shore, waving palm fronds and banana leaves to symbolize the plants that sustained their ancestors. This ritual, rich in music and dance, helps sustain Garífuna culture. 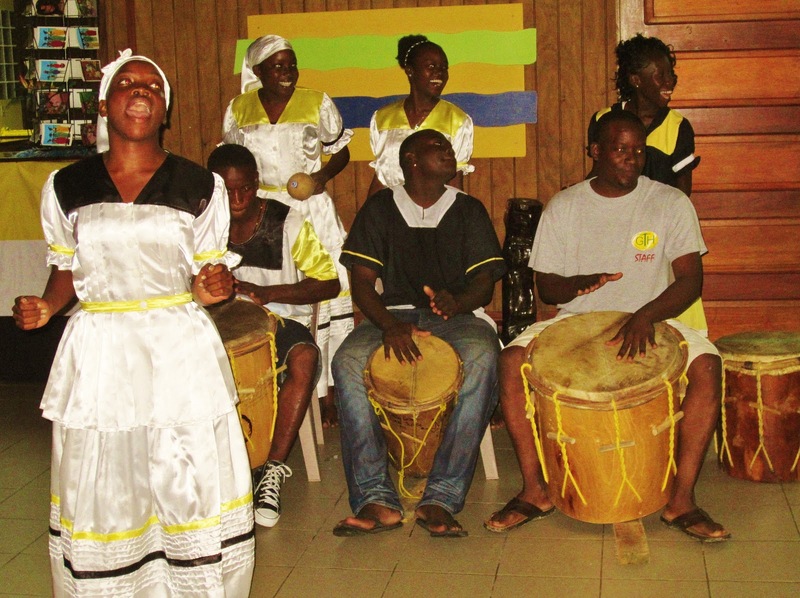 The Garifuna language is losing ground to English and Kriol, but the National Garifuna Council and schools such as Gulisi Primary School encourage young people to maintain their language, culture and music. 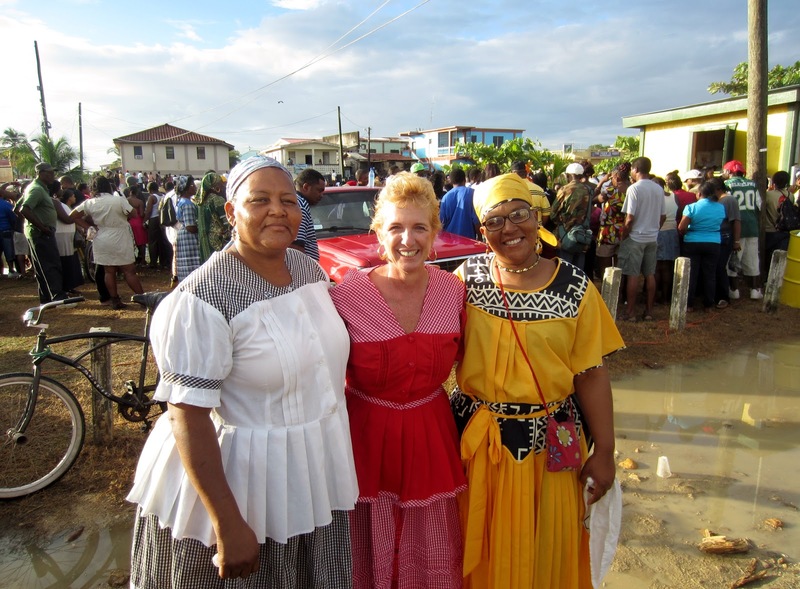 Each year in November in preparation for the Garifuna Settlement Days, several towns with large populations of Garifuna people hold pageants to determine contestants for the Miss Garifuna/Belize final pageant. The winners of each town’s pageant are young women who best exemplify the values of the Garifuna people. The judges interview these contestants, who also must perform traditional dances, reenact scenes from daily life in short skits, and give a speech in Garifuna. I was present for the final pageant in which Miss Garifuna/Belize was chosen for 2011. During the week leading up to Settlement Day, November 19, there are many contests, musical presentations, feasts and celebrations in the schools. However, I was unable to participate in these this year, as I was treated for pancreatitis in the hospital in Belize City for those five days. My colleagues in Dangriga filled me in on what I had missed, and welcomed me back home when I returned on Friday, November 18. That evening there were parties throughout Dangriga, with drumming, dancing and a lot of drinking. Hundreds of visitors flock to Dangriga each year on that night to party all night long and stay awake until dawn on the morning of the 19th to witness the reenactment of the settlement of Dangriga. Due to my recent hospitalization, I was unable to participate in the all-night party, but I was present for the 6:00 AM sunrise reenactment, the parade and the Garifuna mass. I hope to participate fully in next year's festivities.